Firearm Accessory Rails: Which is the Best? With the numerous options for attaching accessories to your firearm, it is often difficult to decipher which is the best. Or even which one you have on your firearm? Below is a list of the most popular options and how to identify them. Far from a comprehensive list, hopefully it will help those unfamiliar with the multitude of options educate themselves on what is available. Named after the Picatinny Arsenal in New Jersey, which was tasked in 1992 to develop a standardized mounting system for the U.S. Army. The design was an adaptation of the Weaver style rails that were on the market at the time. Taking measurements from a variety of Weaver rail products, an average set of dimensions was recorded for the new rail design. The Picatinny Arsenal factory recognized the similarity of the new design to the existing rail design on a 105 mm Howitzer. The Howitzer rail design was scaled down and co-opted for production and inspection procedures. The new rail design was adopted as a standard in 1995 with the designation Mil-STD-1913. NATO Rail - A metric upgraded version of the Picatinny rail, the STANAG 4694 NATO Accessory Rail, was designed in conjunction with weapon manufacturers like Aimpoint, Beretta, Colt, FN Herstal and Heckler & Koch, and was approved by the NATO Army Armaments Group (NAAG) in 2009. The main changes for the NATO rail are the conversion to metric dimensioning, a tightening of certain tolerances, and a change to the preferred mounting contact surfaces for the attachments. The results being a more consistent and repeatable mounting for accessories like scope mounts. Identification of a Picatinny/NATO rail is easy enough by the unique shape and size of the rail. But identification between a MIL-STD-1913 and a NATO rail would be impossible by the naked eye. Here are some bullet points to be aware of when using the rails. A NATO accessory will work on either rail, BUT to get the full advantages of the NATO upgrades a NATO rail should be used. Used for both for scope mounts, and for accessories such as extra sling mounts, vertical grips, bipods, etc. The Weaver mount was developed by William Ralph Weaver (1905) at his telescopic sight company W.R. Weaver Co. The Weaver mount was the basis for the Picatinny rail. The Weaver and Picatinny are essentially the same profile. The most noticeable differentiating feature is the size and location of the recoil slots. Most Weaver mounts are application specific and therefore the location of the slots are defined by the application. The functional result is that some Weaver accessories could be mounted to a Picatinny/NATO rail. But Picatinny/NATO accessories will generally not work on a Weaver rail. The Arca system was first developed in the camera industry back in the 1990s. The originator being a German company called Arca-Swiss. The Arca-Swiss quick release system was originally based on a two-piece mechanism. The first piece, generally referred to as a “plate”, was attached to a camera or a lens (or for the firearms industry typically the handguard). It comes in a standard, “arca-style” 45° dovetail and can vary in length. The second piece is the mounting base, generally referred to as a “clamp”, where the plate gets attached and secured. In any high stress situation (hunting or competition), when shooting from a bipod or tripod, being able to quickly slide the accessory fore or aft to adjust position could be critical for an accurate shot. Cost of accessories has been high as the transition from the camera market to the firearms industry is relatively new. As new products are introduced the cost has come down. In late 2007 Magpul Industries Corp developed the Masada Concept Rifle that featured a polymer hand guard with three elongated vent holes that acted as a negative mounting surface for accessory rails. These slots became one of the first “negative space” attachment systems that allowed the user to put mounting rails only where they were needed, as opposed to covering the entire surface with mounting rails, which are then covered with panels. The system also allowed direct mounting of accessories, such as fore-grips and flashlights, with no rail interface needed. In 2009 the MOE hand guards for the common AR15/M16 firearms were released, bringing the same slot system, along with rails, flash light mounts, grips and other accessories to the mainstream. In the years since the MOE slot system has been released, several million MOE slot compatible accessories have been produced. Initially introduced as a Magpul-specific system, several other companies have built MOE slot compatible accessories in the years since its release. The MOE system was never officially released as an open standard, and the requirement to have access to the back side of the mounting surface limited its application. Additionally, depending on the accessory item, the spacing increments were not always small or uniform enough for desired placement. These characteristics made MOE slots and accessories less ideal to use with free-float hand guards, which did not allow back side access to the mounting surface. Rather than documenting and publishing the existing MOE slot information and weld nut system, Magpul engineers used this opportunity to substantially improve the feature set of the MOE system. The result is the M-LOK. Accessories such as extra sling mounts, vertical grips, bipods, lights, lasers, etc. Open standard, meaning multiple companies can producing products using the attachment system. Helping with number of accessories available, as well as guaranteeing consistency and interchangeability. As for the M-lok, not much to say about the down side of this attachment system. VLTOR Weapon Systems had previously pursued a design which was the basis for the KeyMod system. While developing the first prototype systems Eric Kincel of VLTOR Weapon systems was approached by John Noveske of Noveske Rifleworks with a design for a universal accessory attachment system. After a short collaboration, during which Todd Krawczyk of Noveske Rifleworks suggested an improvement to the accessory lock/anti-rotation nut, John Noveske decided to adopt what became the KeyMod system for the NSR series of hand guards and accessories. The specifications for the KeyMod system were first published in July 2012. The current revision was released in October 2012. KeyMod is an open-source design released for use and distribution in the public domain in an effort to standardize universal attachment systems in the firearm accessories market. The KeyMod system is intended to be used as a direct attachment method for firearm accessories such as flash light mounts, laser modules, sights, scope mounts, vertical grips, rail panels, hand stops, barricade supports, and many others. The goal is to eliminate the need for the rail to be fully outfitted with 1913 rails covering the entire handguard. The KeyMod system allows a user to place MIL-STD-1913 rails wherever needed (even in the 45° positions at times). The KeyMod system consists of two parts: the KeyMod slot and the KeyMod nut. The spacing of the holes is critical and is based on MIL-STD-1913 spacing to allow the greatest modularity with existing accessories. Not as impact resistant? There have been articles in the past noting that drop tests could dislodge the KeyMod accessories, not sure how scientific the tests were. Dovetails come in several different types and sizes depending on manufacturer, with the most common being 11 mm and 3⁄8 inch (9.5 mm). They can be called by a variety of names, such as Tip Off rail, .22 Tip Off Rail, 3/8” Dovetail, or 11mm Dovetail. The 3/8” dovetail is a common profile in the rimfire and air rifle for the US market. The dovetail is measured from the sharp at the BOTTOM of the two parallel grooves. And is cut using a 45deg cutter. The 11mm dovetail is a common profile for many of the low recoil European markets. The dovetail is measured from the sharp at the TOP of the two parallel grooves. And is cut using a 60deg cutter. Roughly a 14mm dovetail is common in the soviet/eastern block firearms. The AK-47 uses a side mounted dovetail (sometimes called a Warsaw Pact Rail) that measures roughly 14mm at the top of the dovetail. There hasn’t been a standard size for many of the firearms coming from that portion of the world. You will find mounts for those dovetails will have a wide range of adjustment to compensate. The 3/8” and 11mm dovetails are a very common mount for rimfire and air rifles. Even though the above-mentioned sizes are the two most common, there is no commonality in the industry. It is getting better but hasn’t settled on one size yet. The small size of the dovetail is acceptable for a low recoil rifle, but a wider Weaver or Picatinny base would create a more stable platform to mount optics. Quick Detach sling mounts (QD), also called Flush Cup sling mounts, is a type of mounting point used for attaching slings. "QD sling swivel" usually refer to the part attached to the sling, while "cup" refers to the corresponding socket on the firearm. The swivel is kept in place by a four-ball detent connected to the push button, which presses against the walls of the socket. 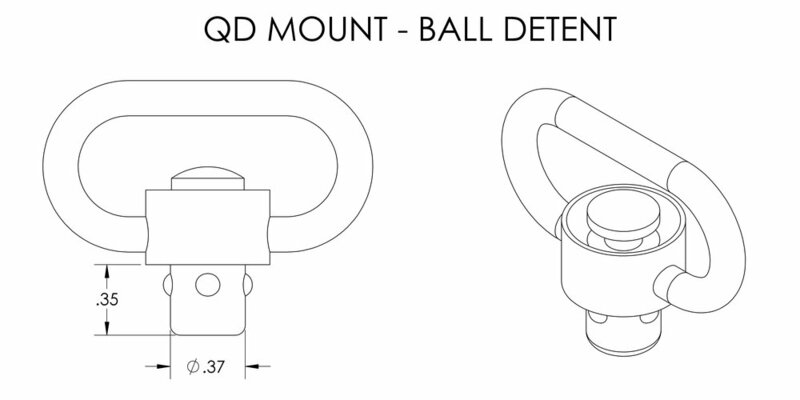 The sling swivel can quickly be taken on and off by pushing the QD button, which retracts the ball detents. Flush cups can be mounted to a long gun in various ways, for instance by drilling a hole in the stock and screwing in flush cup socket, or by using an adapter to other mounting standards such as Picatinny or M-LOK. Cups can be built into a stock, or as an add-on to the side. Depending on the firearm, they may or may not be included. And if they are not, they can be a little spending compared to a standard swivel mount. But the increase in functionality may be well worth it depending on the use required. A sling swivel stud, sometimes called an "Uncle Mike type swivel", is a type of mounting point used for attaching slings and bipods to rifles. Sling swivels can be mounted to a long gun in various ways, for instance with wood or machine screws attached to the stock, a barrel band, or by using adapters to other mounting standards such as Picatinny or M-LOK. The standard sling mount comes in many different shapes and sizes, but the defining features are a 0.15” diameter hole with a width of approximately 5/16”. The sling mount be attached to the stock as a separate part, or in the case of a plastic molded stock, it may be part of the stock itself. The standard for hunting rifles and comes pre-installed on just about every hunting rifle. Not ideal for tactical slings and rifles, as they are typically not positioned in a way that suites that type of use. Thank you for your interest in Catalyst Arms! Thank you for signing up for our News and Updates. You will be added to our list of friends and you will receive the most updated information about new products and events.